Well, first post of the year. First months of the year has been quiet but I have managed to paint (or have started painting) few new units that will hopefully be ready before the end of the month. For Sons I have started on a Reaver Squad, Justaerin Squad, Contemptor and Abaddon. These are all about 80% ready. 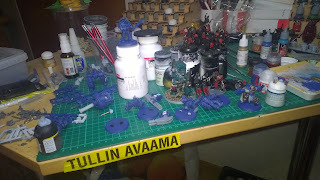 I also started Ultramarines. I have three units from BaC box nearly finished. Terminator Captain, Terminator Squad and Contemptor. I have not yet decided the Forge World this force comes from but im leaning towards Atar-Median with Legio Atarus and Col'Khak Collective. And between all this I still need to build my new gaming table and start with the city fight board.